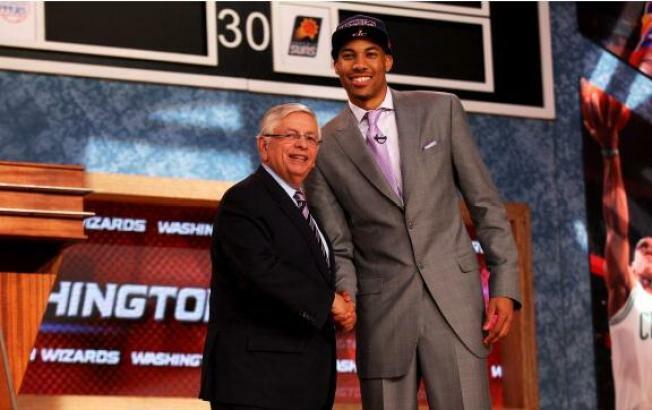 NEW YORK, NY - JUNE 27: Otto Porter (R) of Georgetown poses for a photo with NBA Commissioner David Stern after Porter was drafted #3 overall in the first round by the Washington Wizards during the 2013 NBA Draft at Barclays Center on June 27, 2013 in in the Brooklyn Borough of New York City. NOTE TO USER: User expressly acknowledges and agrees that, by downloading and/or using this Photograph, user is consenting to the terms and conditions of the Getty Images License Agreement. Washington Wizards rookie forward Otto Porter seems ready to make his NBA debut. Porter, the No. 3 overall pick in the 2013 NBA Draft, suffered a strained right hip flexor in mid-September during a pickup game. He practiced with the team for the first time two weeks ago and is expected to return any day. To better understand Porter's injury and why it has taken so long to heal, lets take a closer look at his condition. The hip flexors are a group of muscles that move the hip forward when running and walking. A great deal of stress is applied to this muscle group when sprinting and kicking. A strain to the hip flexor can vary anywhere from stretching to a complete tear of the muscle tissue. Generally, a 1st degree strain involves stretching (or very minor tearing) damage to the muscle or tendon. A 2nd degree strain is associated with partial tearing of the muscle or tendon. And, worst case scenario, a 3rd degree strain is a complete tear. A 3rd degree tear is very rare. Frequently, a hip flexor strain is the result of an overly forceful contraction. A micro trauma can be considered a tiny tear. These tiny tears accumulate over time and eventually result in a strain and pain. It's very likely that Porter gradually developed these tiny tears in the hip flexor as he was recovering from a hamstring injury that ocurred July 17. Therefore, it's my belief that Porter is recovering from a 2nd degree strain that has been exacerbated at times from a previous hamstring injury. This is why it can take as long as it has for Porter to heal and get into basketball shape. Porter is listed as a 'game time decision' tonight when the Wizards host the Milwaukee Bucks at Verizon Center. When Porter does take to the court for Washington, fans will welcome him with open arms. He can only add momentum to a hot Wizards team that has won 7 of the last 9 games and earned the third best record in the Eastern Conference.